Fleas are the bane of any pet owner’s life. They are small, quick and are a complete nuisance to get rid of. Not only do they move through your dog's fur, feeding on its blood and causing it untold aggravation, they also infest your home and can transmit diseases to human hosts. But what are fleas and how do I get rid of them? Fleas are wingless insects that live on the outer layer of their hosts (ectoparasites). With 63 different species in the UK alone, fleas are one of the most common parasites affecting domestic dogs and cats today. Being completely dependent on their hosts for nourishment and survival, fleas can have a massive impact on the well-being of the animals they infest. By taking a blood meal from their hosts, fleas can quickly make an animal anaemic and may even spread infection from one host to another. Common infections spread by fleas include Bartonella bacteria, murine typhus, and apedermatitis. Dogs have also been found to carry the bacteria implicated in Lyme Disease, Borrelia burgdorferi. Flea allergy dermatitis occurs when the host has an allergic response to substances contained in the flea saliva. The cat flea or Ctenocephalides felis is a tiny, sucking insect that is one of the most widespread species on the planet. While its primary host is the cat, dogs are also commonly affected by it. By not extending your pet's flea control to its home and environment, you leave yourself open to further infestation. Both your pet and your home should be treated on the same day. You may suspect your dog has fleas for several reasons. If your pet is badly infested, you will likely see them in its fur and on its bedding. You may even see these fleas on your own bedding and clothes. Cat fleas will be reddish-brown (engorged with blood) and 1-2mm in length. Many describe their appearance as 'pepper-like.' You may also notice scabs or red lesions on your dog's skin where fleas have taken their blood meal. - Fierce scratching and/or biting of the coat. This will be particularly evident in dogs with flea allergy dermatitis as over immune sensitivity causes the skin to become inflamed and itchy. - Excessive grooming as dogs try to alleviate the itchiness and clear away the fleas. You may notice your dog excessively grooming its neck, hind legs and the base of its tail where fleas tend to congregate. Hair loss may be evident in these areas as your dog grooms itself bare. - Fleas are more likely to exist in carpets than in other floor surfaces. If you dog starts avoiding the carpeted rooms which it previously visited the most, it's possible that your dog is being bitten by carpet fleas. Vacuuming regularly can help to alleviate the problem. 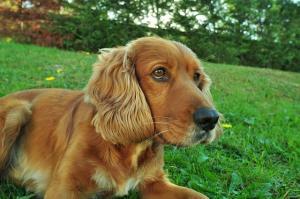 - Dogs with fleas may be more agitated and restless than usual. They may pace, rub themselves hysterically, or dart from one room to another. Dogs that are anaemic due to infestation may display pale gums, muscle loss and lethargy. Flea-related aneamia is more common in puppies, older dogs and dogs with existing illness. So, how can I eradicate fleas? There are many products on the market for the prevention and treatment of fleas, some of which are broad-spectrum and treat infestations of other blood-sucking parasites such as ticks. Spot- on products are topically applied (to the skin), normally between the shoulder blades where they are less likely to be licked off. The products dissolve in the natural oils produced by sebaceous glands found on the skin and are spread over the entire body surface via these oils, allowing contact with all fleas and other ectoparasites present, eventually killing them. Some products contain more than one active ingredient and these may interact in different ways to increase the efficacy of clearing infestations. The animal must not be shampooed or allowed to swim within 48 hours of application to ensure a product binds sufficiently to the skin and hair. Products naturally wear off over time as skin and hair is shed and groomed, and monthly applications are advised to prevent re-infestation. Anti-flea tablets and suspensions (fluid containing solid particles) are orally administered to pets and are absorbed into the bloodstream in the gut. They have systemic effects, eradicating fleas over the entire body by traveling in the bloodstream. They are then taken up when a flea takes its bloodmeal. It is often advised that you give oral treatments on a full stomach or with food to aid absorption. Oral treatments often target fleas at a certain point in their life cycle, for example, the adult stage. It is very important to treat your house with a suitable insecticide to kill the eggs and larvae that would otherwise jump onto your pet when fully developed as adults. To treat your home, you must first vacuum thoroughly and wash bedding at a high temperature (at least 60°C). Product instructions vary, however the normal mode of action is to remove all pets from the rooms being treated and ensure that all floors, carpets, skirtings and soft furnishings are sprayed. Sprays have long-lasting effects and regular vacuuming will stimulate some fleas to hatch so that the adults are rapidly killed by the active ingredients in the spray. Other active ingredients prevent the development of eggs and larvae for up to a year, stopping infestation. Treating pets with suitable products at the same time will protect both your animals and your home most effectively. If you prefer, you could call in a pest control team to treat your home for you, but this may be costly and the products themselves are very easy to use. Shampoos provide short term relief for flea, lice and tick infestations. They are best used weekly and may be more inconvenient to use than alternative products. On the other hand, shampoos help to keep your pets clean and their coats glossy so the extra effort may well be worth it. If you are shampooing your dog, make sure you only use products that are labelled suitable for dogs as many human products contain potentially harmful chemicals.